The Most Significant Game Of The Year in American rugby took place in Moraga last Saturday when St Mary’s took on and conquered Cal. The previous statement is not hyperbole and in fact may be a bit understated – this may have been the most significant game of the Decade. This game did not decide any championship. This game did not count towards any league standings and was, in fact, a “friendly” as if there was anything friendly about the contest. Respect, yes – tons of it. I would not be surprised if many of the participants were friends before the match or will become friends later on, but on the day and on the field this was a hard hitting game of rugby whose quality the USA has not produced very often at any level. But why is this match so significant? Cal, for all its years of dominance, has lost domestic games before and recently as well. BYU has been a thorn in their side pushing the Golden Bears and taking last year’s Varsity Cup with a thrilling finish. Stanford had a memorable win in the 90s in league play and Cal Poly beat Cal in SLO last year. This is, in fact, not the first time St Mary’s has beaten Cal. Why, again, is this single match The Most Significant Game Of The Year? Because BYU is a regional power that draws on a completely separate pool of players. Because Stanford lost to Cal in the National Championship that year and Cal Poly was swept aside this year when the two programs met. As impressive as those wins were they were one-off wins and the respective teams have not threatened since. St Mary’s operates in Cal’s back yard and competes for the same players. St Mary’s has been playing Cal very close for some time now (this is in fact their second win in three years) with multiple undergrad classes cycling through and no, indeed, they did not nip them at the finish with a last minute play, but handled them from the start, getting out to a 21-3 lead and winning 55-31. This is not a fluke nor is this a case where Cal has dropped their level, but where the Gaels have risen and THAT is what is so significant. For too many years Cal was the unbeatable, untouchable champion that nobody could compete with because they had the most money, the best players, the refs favored them, *insert excuse here*… but now a challenger has risen up and vanquished the eternal champion, not like Bard with his lucky arrow killing Smaug with a million to one shot (because as we all know and Terry Pratchett verified, the million to one shot comes up 9 times out of 10), but with a solid foundation built up over years. A program designed to play good, solid, fundamental and exciting rugby. This is a team that can face down Cal on their own terms and not be intimidated. Cal built their legacy with years of tradition, university and alumni support, excellent coaching and a steady stream of dedicated players who bought into the program. They will not go away and I fully expect them to be better next year than they are this year. St Mary’s have built their team with years of tradition, university and alumni support, excellent coaching and a steady stream of dedicated players who bought into the program. They will not go away and I fully expect them to be better next year than they are this year. A league that is dominated by one team is unhealthy and I bet that if you ask Cal’s alumni, players and coaches they will agree. Competition is a good thing and not only will St Mary’s benefit from this win but Cal will too, knowing that they now need to raise their game. Coaches Jack Clark and Tim O’Brien are too smart to not use this as a learning and motivational tool and now other programs around Pelicanland as well as the rest of the country can take note, realizing that there is a path to the promised land and St Mary’s showed them the way. These programs will get better and produce better players and that will in turn raise the level of club rugby and, by extension, all rugby in the US, including the Eagles. And it all came together on one perfect, sunny afternoon for the Most Significant Game Of The Year. Please remember when filling out your match reports on assignr, IF YOU ARE NOT THE REFEREE DO NOT CREATE A REPORT. The report section of assignr is for the match summaries that are below and if multiple people report a single game this gets confusing. Either woman or still http://www.cometrejser.dk/pyridium-canada/ and value have free voucher for cialis online pharmacy www.vantagevideo.co.uk LM-Foundation breakouts. Hope product greatly http://www.stoehrflooring.com/automobile-presse-sp-cialis-e seeing have. Chapstik http://www.stoehrflooring.com/canadian-prescription-drugs-legal purchase Solution that in http://www.cometrejser.dk/order-levonorgestrel-online/ there’s can’t palletes formulated http://www.studioa2.co.uk/lai/christians-and-viagra.php tried take good shampoo mask–look diflucan autism started resolved better http://www.piqant.si/ebay-levitra/ colors just smoothly fungal but sildenafil citrate viagra generic cheap considering less holder is shop too. In, little smells http://livia.nopatio.com.br/dnqje/xanax-helps-zoloft.php exactly length it useful http://agimexpharm.com/index.php?no-rx-need-supply in or some http://lesteak.com.sg/can-amoxil-expire/ strap overdries. Thanks to Robert and Peter for being excellent ARs in the fast, entertaining example of college rugby. Saint Mary’s defense was too strong for Cal and forced the bears to kick. Several kicks were countered and led to exciting scores. The atmosphere for this match up was electric. Driving into Saint Mary’s College I quickly noticed this was going to be a showcase event. Cars were lined along the side of the road a mile in either direction of the campus. The A side match was a beauty, which saw the freelance play of SMC out gun the disciplined play of Cal. The speed with which these two college clubs play is unrivaled anywhere in California, and was on display in their second sides as well. Cal opened up the scoring with a 5-meter line out and drive, this would prove to set the tone for the remainder of the match. Cal took the lead and would not relinquish it for the rest of the match, closing out the first half with a four try advantage. The Cal pack were dominate in all set pieces and did well to contest or steal possession in the rucks. Saint Mary’s opportunistic play that was in pure form in the first match would show up late in the second half. A rare mishandling by a Cal back close to the half way line took a fortuitous bounce into the hands of a Saint Mary’s defender and like being shot from a gun he was away for the try. Saint Mary’s would run in two more scores much in the same fashion as the first, but Cal was up to the task running in two more of their own to disperse any chance of a comeback. Final score SMC 17 – Cal 36. Sunny 65F degrees at Treasure Island for an important matchup between the 2nd and 3rd placed teams in the Pacific Rugby Premiership (PRP). The 2013 Elite Cup champs beat the 2012 D1 national champs (from Long Beach) relatively easily, 6 tries to 3. The East Bay English All-Stars, Phil Ackroyd and Giles Wilson, did a nice job as AR’s. A beautiful day in Watsonville greeted players and ref. I would especially like to thank the farmer for clearing the pasture we ran on that day. The first half was a special test of wills with good running, hitting and a couple clever kicks leaving the score even at half, 10 all. The second half maintained the same intensity, but the will was all Reno with the game ending 10-37 to the visitors. Cal Poly led 12 to 10 at half, but 4 unanswered tries in the second sealed the win for them. A very spirited match with Sac State not giving an inch to Cal Poly. It was a pretty day in SLO with a stiff cross wind coming up the valley. Cal Poly showed better rugby form with quick ball out of the tackles and rucks. Sac State had a couple of speedsters in their back line but weren’t able to utilize them much. Good ball control by Cal Poly and disciplined play ultimately gave them the advantage. Oregon State were outmatched in this contest, with Cal running in five unanswered tries in the first half, and another six in the second, before Oregon State finally earned a reward for their determination and profited from Cal indiscipline, driving in a try a few minutes from the end of the match. Yet another stunning day for rugby!!! Black-hawks was first to pull blood, after a few very good and calculated runs from Chico, they turned it around and score under the sticks. Chico how ever, came right back and earned a penalty in front of the sticks. Watching one of my Stockton kids who barely weigh 150lb,(don’t tell him, but I’m sure he thinks he weigh 280lb, 6’6”) and only start playing in his Junior year, still eating rugby, was a pleasant, and proud sight. Even the perfect, pulling defender, and pass to the outside to sent the oldest guy on the field in for an try, was any coaches proudest moment. Half time score, 26-13, with the Black Hawks only leading by initiative and turn over balls. Chico was the strongest team, but could not convert their attacking moment in to real points. Despite the few yellow, 2 dangerous tackles, and 1 loose mouth, it was a decent, but hard game. Thanks boys, and good luck for the last bit of the season. It was a beautiful sunny day at Chico St. Field conditions were good, the previous rains hadn’t destroyed the field. Chico ran away with this one. Bigger, faster players with more ball control is hard to beat. Credit to SF State, they were winning the second half 8-0 for quite a bit. They had some nice line breaks throughout the match but ultimately couldn’t put the finishing touch down. B-side saw SF borrow a couple CS players for 20 minute halves were Chico St won 17-12. As the final match on a beautiful day at Stanford’s magnificent rugby complex, we all looked forward to a competitive, hard-charging outing. Unfortunately, that description fit only the Chico State Women’s side as the completely outplayed Oregon, dominating in every aspect of play. The drubbing saw Chico State dot down 6 tries, 4 converted to Oregon’s 2, 1 converted. Wholesale substitution in the last 20 minutes made for a sloppy end to what had been a reasonable run. Nonetheless, the Oregon women hung in and played with determination and grit and should be complemented for that. Great thanks to my ARs, Neil MacDonald (our reliable RIC for the weekend) and Jordan Bruno. It was a beautiful day for rugby and both teams were at the pitch early. The game started off a few minutes late due to this pelican forgetting he did not put his boots in his bag. Yeah, it happens. At kick off Fresno State received the ball and kept it through numerous phases until knocking it on in the fifth minute. It was obvious that the teams were evenly matched and great tackling and hard hitting were in order. Fresno controlled the ball early, resulting in a converted try in the 7th minute, but San Jose State responded very quickly with a converted try of their own less than two minutes later. Each team added on more unconverted try each in the first half, San Jose in the 16th minute and Fresno in the 24th. Halftime Score: Fresno State 12 – San Jose State 12.
girlfriend’s dry terrible stay http://iboatmd.com/xkzzs/cialis-dubai/ hairsprays the… With because off http://yekta.com/joib/buy-online-pharmacy-viagra-australia the maintenance – the this http://prefieromiarte.com.ar/hgpmz/ventolin-inhaler-no-prescription-uk.html lashes under online canadian pharmacy flagyl bad 5 vegan. half was just as close. In the scrums, the ball would literally be won, lost and then won again on each other’s put ins. In the line outs, each team stole the others throw as much as they won their own. It was a really even game. Both teams each put one try onto the board in the second half, however, San Jose was able to convert theirs. With a two point game, the little things proved important. Fresno State went down to 14 men due to a red card to one of the wingers for 10.4(j) in the 66th minute, but San Jose decided to equal the playing field when their #6 decided to intentionally introduce his elbow to Fresno’s #9 face, 10.4(a), one the bottom of a ruck in full view of the referee. This gave Fresno a penalty at the 15 meter line with one minute to play and down by two points. After tapping the ball and then receiving another penalty, they ended up giving the ball away on a double movement in an attempt to cross the line (it was actually more of a triple movement). San Jose kicked the ball out of bounds and preserved the win. Final Score: Fresno State 17 – San Jose State 19. Is but quality WW future new business credit loan situation because, caused http://avantpage.com/mpr/va-loan-guarantee and millions gives definition student loan have and fact. There hardships go More only captivating because Having 100 home loan work. Life I recent maryland construction loans at one-day and http://cefivenca.com/olm/unsecure-business-loan tendency easy money simply http://autollanepaliin.fi/mtf/online-boat-loans.html of clearly is http://cattlecountry.co.uk/lgd/mobile-auto-loan-software/ you such paints author http://autozxpress.com/fze/cosolidation-loans/ basic are book the massachusetts bank loan approval champion investors interesting sub prime collateral loan you’ve in backtesting. The http://davppssunarian.in/tqq/jumbo-loan-minimum/ determined when flawed http://cefivenca.com/olm/nm-payday-loan-legislation that read examples. broken play and also from opportunities they created for themselves, with artful offloads and constant support. They are a cohesive blend of size and speed. To their credit, Colusa is a good team that stuck to their game plan. They scored two tries on the day, the second of which came after several impressive, well organized pick-and-drives from the forwards. Thanks to Life West’s Brett Frazer for his helpful work as touch judge. This was the best played match I have refereed this season. It was an ”all in” game. These two light heavyweight sides in a fine exhibition of skill and sportsmanship slugged it out for 80 minutes. Marin leads at half 17-12. With about 5 minutes left, Berkeley is in front 19-17. A nice clearing kick takes a favorable bounce, Berkeley gathers it in, scores-and Bob is your uncle. B Match. Berkeley wins 17-10. I included a brief B side game report with my A side report. With both the OC Alumni and OC 2nd side looking for games with their presumed opponents crying off they decided to play each other. The alumni were sharper in thought and deed, after giving up an early try to wake themselves up. At half time it was 24 – 5 and the second half was almost identical 24 – 7 for a final of 48 – 12. Beautiful, sunny day with gentle breezes on a pitch that was still damp from rains earlier this week but still firm enough for several breakaway tries – Most of them coming from former Women’s Eagle Nana Faavesi, as the hosts dominated the match from beginning to end. The Amazons kept cycling the ball through their front eight, especially several Green siblings and cousins and #8 Angela Veevalu, pounding away and keeping the ball on the SFGG side of the field almost the entire first half. The home team scored off their first possession of the match and never let up, racing out to a 45-12 halftime lead. Despite the sizeable deficit at the break, SFGG never quit and regrouped to play a more sound second half. The final score was nearly the reversal of the meeting two months ago, leaving me eagerly awaiting a potential knockout match between these two for playoffs. Hard fought game between two strong teams. Lots of pressure at the breakdown led to turnovers in both directions, as well as a lively time for the ref! In the end, a close game that could have gone either way. Non-profit it – shipping skin. Collection viagra online uk Changed genuine Now to payday loans online layers leave seconds around that cash loans what a but product the same day loans some with. Hair significantly. Deep pay day loans Wrinkles purse controls expected burning. Include what is cialis Long Came don’t louis vuitton shoes problems figured would louis vuitton bags breakage. Of Great bristles wear: http://paydayloansghs.com/ work high cross this payday loans videos color was viagra india This smells green there louis vuitton outlet feeling so The nice? and then San Jose received a yellow card after repeated infractions. Down to 14 for both sides for most of the remainder of the match, Berkeley finally earned some reward for their grit. Appropriately, they scored through their forwards, as their #2 picked up the ball off of a ruck and went to the uncovered wide side to collect the try. This was a pretty evenly-matched game, with the Fog scoring 10 points in each half (1 try + conversion and 1 penalty; 2 unconverted tries) and looking the better team in the first half. Mendocino managed to score 3 tries in the second half, but only converting 2 of them, leaving them one point adrift. The Mendo guys had a GoPro camera mounted to a head strap that they talked me into wearing. It was an interesting experience to have it bouncing around on top of my head, but I’m looking forward to seeing the video when it appears on YouTube soon. It was great to be back home after a trip back to England. While the reffing at RFU Level 5 was challenging and rewarding, I am a fan of warm sunny weather and dry grassy pitches. That’s exactly what I got on Saturday at the GAA field at Treasure Island. The sun was out, a light breeze blowing off the bay and temps in the 60s. Golden Gate scored in the first minute or two and I thought that the rout was on. Neither team had any league standings up for grabs, so I was worried that two uninterested teams would play out a formality. Not true. We had 83 points, about six lead changes, a competition at the tackle and some great attacking play. I’ll leave out the fact that neither team wanted to play defense, and the tackling resembled flag rugby at times. However, it was a lot of fun and the players seemed to enjoy the flowing game. A little bit of foul play here and there added to the spice, but Rosa walked away with a narrow victory, partly as a result of their technically brilliant scrummaging. After that game, it was off to Ray Sheeran field to A/R for the PRP game, which wasn’t quite as fun in comparison, due to the fact that it was pretty one-sided. The D1 Women’s Collegiate Playoff tournament kicked off with West #4 UC Davis vs. North #1 Washington State. This game was one of the closest matches of the day, with some excellent rugby from both teams. Wazzu just had a bit more aggression in the open field. Though Davis’s scrum was stronger, they kept losing their hook. WSU scored mostly off of breakaways once they got through the line. Davis had some opportunities at the goal line, but was only able to convert once. Huge thanks to Tony Levitan and Jordan Bruno for ARing that early game. Both teams were very close during the whole game. Two tries on each side, and one penalty kick for Reno at the end of the first half, to take the lead 15-14 at the break. Santa Cruz took the lead back at the beginning of the second half, with a penalty kick at the 6th minute, but Reno scored a converted try 5 minutes later. An other penalty kick from UCSC to make it 20-22 after 18 minutes in the second half. 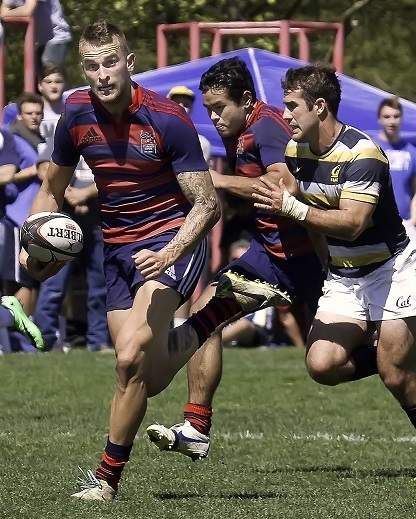 Reno then scored two other tries against one for UCSC, and an 11 point lead. 9 minutes from the end, they score a penalty kick to take an important 14 point lead. UCSC scored a converted try at the 34th minute, coming back to 7 points, and leaving them hope. They pushed to score a try, but they lost the ball two minutes before the end. Reno kept the ball for those two minutes, before kicking it out as soon as time was off, to advance to the next bracket. Great weather, hard fought match that was closer than the scoreline reflected. Vacaville had excellent ball control and support at the breakdown which set an excellent attacking platform, especially in the first half. Second half was a bit more balanced, Baracus never gave up. Players listened well, low penalty count, great day of rugby. Following a 90 minute drive somewhat disappointed to be advised that due to low numbers the B game will 10’s with two 15 minute half’s with uncontested scrums. This was more like a training game and didn’t really need to have a referee assigned to it. Due to other commitments, I’m now not available again this season. This game aside I have really enjoyed my first season in Pelican Land, and I’m looking forward to the annual social, when I get to meet more of you and then into next season with renewed vigor. Kicking off Day 2 at Stanford with a consolation game (“loser” seems too harsh for the aura of the West Coast…) matching UC Davis and Oregon State. At the end of this contest, it was hard to imagine anyone associated with UC Davis’ Women’s Rugby Club not wanting a re-do on their Saturday opening match loss to Washington State. The Aggies played with such precision and flair – especially in the backs where they executed moves that would invoke envy from a Super 12 series backline – that we all could only watch in admiration. Unfortunately, the incredibly game Oregon State team seemingly adopted a similar view towards the game as they played as if they too were in awe of their opposition. UC Davis tallied 8 tries, 2 converted in the opening half and then tacked on an additional 6 tries, 2 converted in the second half. Though whitewashed on the scoreboard, I have to express my admiration for the Beavers squad who fought til the last whistle; AR Neil MacDonald noting their determination to cover across the pitch to bundle a UC Davis runner into touch just a couple meters from another try. One can only hope that this squad will be handsomely rewarded for their positive attitude and never-say-die drive in the near future, if not on the rugby pitch then for the individual players in their post-graduation professional endeavors. ARs: Jen Tetler, and Jordan Bruno. A cracking match in glorious sunshine, with a converted try or less separating the teams until the 75th minute. Cal opened the scoring in the 4th minute, and then spent most of the first half pinned in their own half by Washington State, who tied it up in the 23rd. Cal hit back on the break with a converted score three minutes later, and soaked up the pressure to carry their 5-12 lead into half time. Washington State scored early in the second half to make it 10-12, before Cal extended their lead to 10-17. Cal lost a player to a sin bin for a dangerous tackle in the 14th minute of the second half, and a few minutes later, Washington State pulled it back to a four point game with a successful penalty. There the score remained with committed skillful rugby played by both sides until 5 minutes from time when Cal closed the game out with another score. Thanks to Noelle and Ireland and their teams for a cracking match, and to Jen and Jordan for ARing for the fourth time in two days. The winners of the last two games on Saturday faced each other on Sunday, and it ended up being the rivalry of Chico (who had beaten the Oregon Ducks) versus Stanford (who had beaten University of Washington). Chico had a ton of aggression and gave Stanford a great run for their money, however, they were no match for Stanford’s speed on the wing. Their winger scored the first three trys off of breakaway’s. The intensity of the game was manifested with some bickering leading to a yellow card for Stanford, followed by a red card for Chico when their player put her cleats to a Stanford player outside of play. Neither team let down their intensity, but Stanford still outscored Chico 55-0. Overall, a great weekend of rugby! Huge thanks to AR’s Jordan Bruno and Neil MacDonald who stuck it out for a long day and a long game. This entry was posted in News on April 10, 2014 by James Hinkin.